Nursing home administrators, nursing staff and other long term care professionals will descend on Florida’s Capitol today to ask lawmakers to reduce the Medicaid funding cuts to preserve quality care and protect caregiver jobs in Florida’s nursing homes. 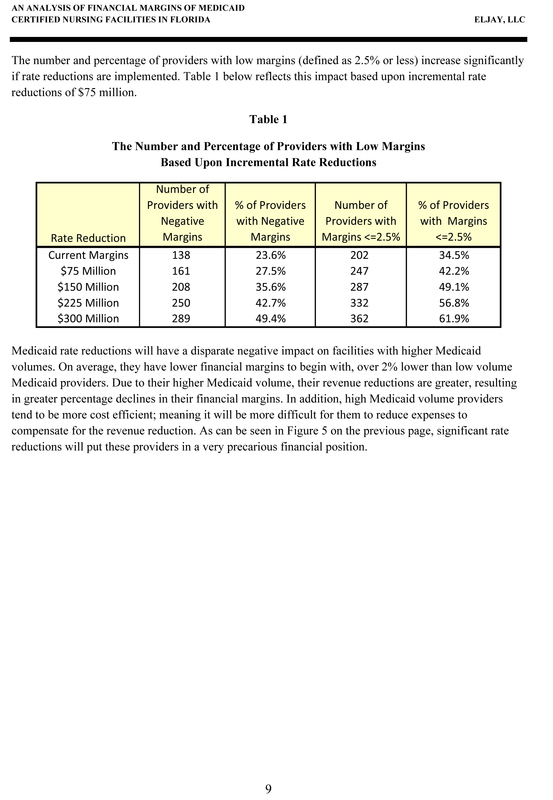 The current Medicaid funding cuts contained in the House ($201 million) and Senate ($144 million) budget proposals would result in over one-third of facilities experiencing negative operating margins, and 50 percent of facilities having profit margins of less than 2.5 percent. A recent report by the Florida Health Care Association indicates that some facilities would lose as much as $1.2 million if the proposed budget cuts go into effect. Additionally, as the House and Senate continue discussions on their Medicaid reform bills, long term care advocates are urging the Senate to support the tort provisions contained in SB 1972, the Senate Medicaid reform bill, which would eliminate loopholes in the law which allow predatory trial attorneys to artificially inflate the costs of defending litigation and the value of claims brought against nursing homes. Over 100 representatives from Page Healthcare in Ft. Myers, Life Care Centers of America, which operates 21 skilled nursing facilities in Florida, Lavie Management Services, which manages 53 facilities, and FHCA’s Districts II, IV and V in the Orlando, St. Petersburg and Tampa Bay areas, respectively, were in Tallahassee as part of FHCA’s Lobby Wednesdays. Representatives from Signature HealthCARE also took part in this weekly grassroots initiative, which will bring over 400 long term care professionals to Tallahassee over the course of the 2011 legislative session. Hear from FHCA Executive Director Emmett Reed, who gives an update on the House/Senate Medicaid funding cuts; over 80 members in town to advocate for long term care. The steady gains in nursing home quality improvement and the financial stability of Florida's nearly 700 nursing homes are at risk as Florida legislators discuss Medicaid funding cuts to nursing home care. Currently, the Senate has proposed a $144 million cut and the House a $202 million cut to nursing homes. Some counties will experience as much as $23 million in reductions as shown in the recent reports by the Florida Health Care Association, which outline by Senate and House districts the estimated nursing home rate reductions, including a county-by-county analysis and facility-specific impact. Nursing homes are extremely sensitive to Medicaid rate reductions, since nearly 60 percent of residents rely on Medicaid to cover the cost of their long term care services. Medicaid often fails to cover the actual cost of providing nursing home care, with facilities losing an average of $11.87 a day or just over $280,000 per year. The Legislature’s proposed cuts would result in over one-third of Florida’s facilities experiencing negative margins, and nearly 50% of all facilities would face margins of less than 2.5%. With the majority of Florida’s nursing homes mandated by a minimum Medicaid patient occupancy requirement, facilities which are already operating at a deficit when it comes to Medicaid residents will have no ability to recoup from these significant reductions. Almost 100 long term care professionals from across Florida are in Tallahassee today to advocate for the preservation of nursing home quality care as lawmakers advance their Medicaid reform bills and budget proposals begin to unfold. Administrators, Nurses, Activity Coordinators and other direct care workers will discuss with lawmakers the importance of delaying the long term care implementation under the House managed care bill, which would allow time to ensure important protections are in place to preserve the steady improvements that have been made in delivering quality nursing home care over the past 10 years. These senior care advocates will also address the current proposed Medicaid funding cuts, which amount to $141 million in the Senate and $200 million in the House. With nearly 70 percent of nursing home operating costs directed toward staffing, reductions of this level put quality care at risk. Other important proposals under consideration include the importance of meaningful tort reform to saving taxpayer dollars and enhancing senior care, as well as streamlining regulations and eliminating conflicting demands on valuable front-line caregivers who are spending time on unnecessary and duplicative processes, while at the same time giving regulators more time to spend on meaningful reviews of provider services. Representatives from Cypress Health Group, which manages 18 skilled nursing facilities in Florida, Activity Professionals from across the state, along with long term care professionals from FHCA’s Districts XIII in the Okeechobee/St. Lucie area, are in Tallahassee as part of FHCA’s Lobby Wednesdays. This weekly grassroots initiative will bring nearly 400 long term care professionals to Tallahassee over the course of the 2011 legislative session. Hear from FHCA Executive Director Emmett Reed on the House Medicaid managed care bill, members in town to advocate for long term care and other important bills we're tracking. Advocates for Florida’s long term care profession traveled to Florida’s Capitol today to urge lawmakers to protect nursing home quality care as they consider Medicaid reform proposals and prepare to release their legislative budgets. More than 75 nursing home caregivers from across the state met with their local legislators to share the message that nursing homes are efficient and provide quality care to people whose 24-hour medical needs don’t allow for them to safely receive that care in alternative settings. As the Legislature works to overhaul the Medicaid program, protections must be made to safeguard the more than 71,000 frail, vulnerable seniors receiving quality care in Florida’s nursing homes, 60 percent of who rely on Medicaid as their only safety net to cover their health care needs. Other important proposals under consideration include meaningful tort reform to ensure that precious state and federal funding is used for continuing the steady improvements to nursing home resident quality care rather than predatory lawsuits. Providers also discussed a number of bills which would streamline the regulatory process and eliminate conflicting demands on valuable front-line caregivers who are spending time on unnecessary and duplicative processes when their time is better spent at the residents’ bedsides. Representatives from Gulf Coast Health Care, which manages 34 skilled nursing facilities and three assisted living facilities in Florida, the Pines of Sarasota and Consulate Health Care, which manages 21 skilled nursing facilities in the state, along with long term care professionals from FHCA’s Districts IX in the Jacksonville area, were in Tallahassee as part of FHCA’s Lobby Wednesdays. This weekly grassroots initiative will bring nearly 400 long term care professionals to Tallahassee over the course of the 2011 legislative session. For more information about FHCA Lobby Wednesdays and the Association’s 2011 legislative priorities, click here. Hear from FHCA Executive Director Emmett Reed on the issues providers will be facing this session and how you can become an advocate for long term care. Today was the opening day of the 2011 Legislative Session in Tallahassee, and already one of FHCA's priority bills easily passed through its first committee. HB 311 by Rep. Ken Roberson (R-Port Charlotte) helps clarify how cities should apply occupational taxes to persons who are employees of businesses that already pay the tax. This is an important issue for nursing homes, whose Certified Nursing Assistants, for example, could be subject to such a tax as the local level without this exemption, thus negatively impacting their ability to work and the facility's ability to maintain an adequate workforce. Speakers against the bill represented local city and county governments who discussed the “loss of revenue” they will experience under such exemptions. Rep. Eric Eisnaugle (R-Orlando) pointed out during the discussion that, while it might be a loss for the city government, it is a boon to small businesses and the citizens of Florida. HB 311 and its senate companion, SB 582 by Sen. Nancy Detert (R-Venice), are a priority for FHCA, as these bills would exempt CNAs from being inappropriately taxed, ensuring these caregivers don’t become a “pay for” solution for our local government’s economic challenges. The bill now moves on to the House Finance and Tax Committee, while SB 582 is currently in the Senate Community Affairs Committee. On Friday, the House released two proposed committee bills establishing the Medicaid program as a statewide, integrated managed care program for all covered services, including long term care services. The proposal would be fully implemented by October 1, 2016. The long term care component of the plan would require implementation to begin by July 1, 2012 with full implementation by October 1, 2013. PCB HHSC 11-01 creates a new section of law entitled “Medicaid Managed Care” which creates provisions for the Medicaid managed medical assistance program, the long term care managed care program, and the managed long term care for persons with developmental disabilities program. The agency is required to adopt any rules necessary to comply with or administer the program and to apply for and implement state plan amendments or waivers of federal laws and regulations necessary to implement the program. Specifically, sections 409.978-409.985 is created to describe the long term care managed care program. As noted, the agency shall begin implementation of the statewide program by July 1, 2012, with full implementation by October 1, 2013. Medicaid recipients requiring nursing facility care as determined by the CARES Program and who are either 65 years of age or older or eligible for Medicaid by reason of disability are eligible for the program. All Medicaid recipients who are either residing in a nursing facility or enrolled in a Medicaid waiver program on the date long term care managed care plans become available in their region are automatically eligible to participate for up to 24 months without being re-evaluated for their need of nursing facility care. The bill further defines the benefits available under the program. The state will be divided into seven regions and a specified number of qualified plans will be procured for each of the seven regions. Qualified plans may be managed care entities or long term care provider service networks (owned by health care providers) or entities qualified under 42 C.F.R. part 422 as Medicare Advantage Preferred Provider Organizations, Medicare Advantage Provider-sponsored Organizations, or Medicare Advantage Special Needs Plans. Selected plans must offer a network contract to all nursing homes, hospices, and aging network service providers in their region for the period between October 1, 2013 and September 30, 2014 after a qualified plan is selected, but may exclude the provider from the network after 12 months of active participation for failure to meet quality or performance criteria. Nursing homes and hospices are required to participate in all qualified plans in the region in which the provider is located. Plans are required to monitor the quality and performance of each participating provider using measures adopted by and collected by the agency, but may use additional measures that are mutually agreed upon by the provider and the plan. Plans are required to pay nursing homes an amount equal to the nursing facility-specific payment rates set by the agency, but are allowed to pay mutually acceptable higher rates that may be negotiated for medically complex care. Incentives are provided to Plans to reduce institutional placement and increase the utilization of home and community based services with a stated goal of achieving no more than 35 percent institutional placement. The bill also establishes a long term care managed care technical advisory workgroup to assist in developing Medicaid eligibility criteria, provider payment requirements (methodology and prompt payment), uniform requirements for claims submission and payments, and Medicaid enrollment pending determination of Medicaid eligibility. PCB HHSC 11-02 also deletes many sections of current statute upon the implementation of the statewide managed care program including the long term care community diversion pilot program. On the eve of the opening of the 2011 Legislative Session, Florida Health Care Association’s (FHCA) final installment in its State of Long Term Care series sheds light on the importance of steady and stable funding for Medicaid and Medicare to preserve the ongoing improvements that have been made to nursing home residents’ quality care. The State of Reimbursement Fact Sheet demonstrates how nursing homes are extremely sensitive to Medicaid rate reductions, since nearly 60 percent of residents rely on Medicaid to cover the cost of their long term care services. Medicaid often fails to cover the actual cost of providing that care, with facilities losing an average of $11.87 a day or just over $280,000 a year. Furthermore, 70 percent of nursing home operating costs are attributed to people working in facilities – nurses, CNAs and others – which means lack of adequate funding could result in job losses, putting resident quality care at risk. The State of Reimbursement Fact Sheet also points to the importance of the Nursing Home Quality Assessment, which was created in 2009 to help nursing home care avert devastating Medicaid funding cuts. The Assessment has brought in an additional $622.5 million in federal Medicaid funding and helped save the State of Florida $219 million in General Revenue in the 2010-2011 Fiscal Year. FHCA Provider Program - Legislative Committee Chair Deborah Franklin, "Stay Informed, Get Involved and Make a Difference"
Stressing the important contributions nursing homes make to Florida’s economic activity, Florida Health Care Association today issued the third installment of their informational State of Long Term Care series. Florida’s long term care industry generates $20.2 billion in economic activity and supports and creates over 259,250 private sector jobs, a recent study by the American Health Care Association found. Florida Health Care Association is urging lawmakers to protect Medicaid funding streams to ensure these facilities can continue to play an important role in economic recovery while carrying out their commitment to provide quality care to Florida’s more than 71,000 long term care residents. Emphasizing that the demand for long term care will only increase – with 64 percent of Florida’s population by 2030 being seniors– the State of Long Term Care Workforce/Economic Impact Fact Sheet highlights the importance of stable Medicaid funding in supporting the health care needs of frail elders, 60 percent of who rely on Medicaid to cover the cost of their long term care services. With business lines stretching well beyond health care into transportation, food service, real estate and other sectors that keep the economy strong, Florida’s long term care facilities rank 14th in terms of largest overall employment. The week-long State of Long Term Care series will bring awareness to Florida’s long term care demographics, Medicaid reimbursement challenges, the economic impact of the profession and the steady improvements that have been made in quality care. Emphasizing the increased number of direct caregivers working to provide quality care and the milestones in resident and staff satisfaction, Florida Health Care Association (FHCA) today issued the second installment of their informational State of Long Term Care series in advance of the opening of the 2011 legislative session next week. The State of Quality Fact Sheet highlights the measureable improvement that has occurred in nursing homes in 16 of 26 quality indicators nationwide between 2000 and 2009. Additionally, since the introduction of Florida’s increased nurse staffing levels and other quality standards in 2001, average deficiencies per facility have decreased and measures of resident care outcomes have also improved. Those mandated increased staffing standards have resulted in the creation of over 11,000 new Certified Nursing Assistant and 700 new nursing positions since 2001. Research has also shown that family and resident satisfaction has steadily improved as a result of facilities utilizing quality improvement programs more broadly, resulting in improved quality of life for residents. The adoption of Culture Change (also known as person-centered care) in facilities is also leading to higher resident and staff satisfaction and better workforce performance, both of which can lead to quality care improvements. Underscoring the State of Florida’s ability to ensure those needing long term care services receive the most appropriate care in the least restrictive setting and nursing homes’ ability to effectively deliver that high quality care, Florida Health Care Association (FHCA) today issued the first installment of their informational State of Long Term Care series in advance of the opening of the 2011 legislative session next week. The State of Aging and Long Term Care Fact Sheet demonstrates that Florida’s over-65 population to nursing home bed population is among the lowest in the country at 2 percent versus 3.5 percent nationally. The Fact Sheet profiles today’s long term care resident, noting these individuals need assistance with 4.2 activities of daily living. With nursing homes playing an important post-acute care role and discharging patients at a higher rate today than ever before, this leaves only one third of today’s nursing home residents as the “long term care resident.” Often these individuals have Alzheimer’s or related dementias which require 24-hour skilled care and oversight, and as a result they could not be safely cared for in an assisted living facility (ALF) or at home. A recent study by the Florida State University Claude Pepper Data Center presented before the legislative committees charged with architecting Medicaid reform proposals found that the average Medicaid nursing home caseload has decreased from 47,059 in 2001 to 42,661 in 2010. The study raises important considerations related to Medicaid managed long term care, pointing out that the effort to transition nursing home residents back to the community have required assisted living facilities (ALF) to offer a wider range of care. It notes, however, that the “typical” nursing home resident could not receive the appropriate medical care in an assisted living facility (ALF) where nursing services are limited and state and federal oversight of those services is less intense. In advance of the 2011 legislative session, Florida Health Care Association today is launching an informational series on the State of Long Term Care to bring awareness to Florida’s long term care demographics, Medicaid reimbursement challenges, the economic impact of the profession and the steady improvements that have been made in quality care. Florida is the oldest state in the U.S. with over 4.4 million seniors and over half a million with Alzheimer’s or related dementias. By 2030, Florida’s population will grow by 5.1 million and 64 percent will be seniors. The needs for long term care will only increase.